The golden short distance runner Mohammed Aman gives his nation the second gold in the Moscow World Championships men 800 meters race. The whole race was breath taking; it was very close to call who would win the game. Yet at last, after the scintillating scenes that appeared Mohammed was losing the race, it all came to him as he sprinted forward with all the force and muscle he has in reserve. In deed the race shows Ethiopia can do it in the short runs as it has done in the long distance runs. 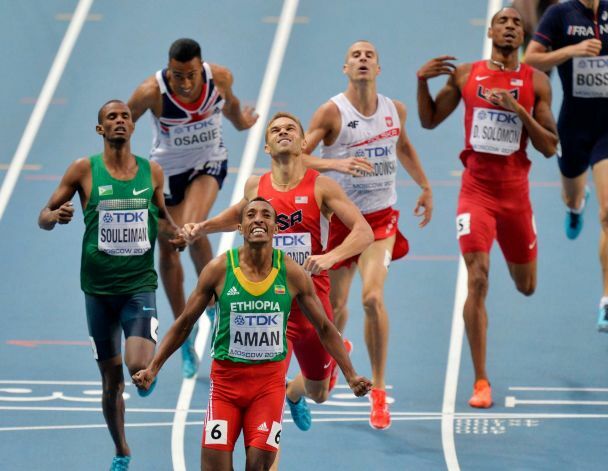 There is no better proof to this other than this golden boy Mohammed Aman who frequently wins 800 meters. He brings the spirit of Haile Gebresilase and Kenenisa Bekele to the short distance run race. He is a new model in the Ethiopian athletics history particularly in the short run distances that Ethiopia hasn’t been popular for quite some time. Now it is changing as Mohammed Aman illustrates that it is possible for Ethiopia to put in golden performance in the short distances runs too. Ethiopia celebrates his victory as colorfully as it rejoices the triumph of Tirunesh Dibaba in 10,000 meter race. Ethiopia’s Mohammed Aman, center, reacts as he wins gold ahead of United States’ Nick Symmonds, fourth from right, and Djibouti’s Ayanleh Souleiman, left, in the men’s 800-meter final at the World Athletics Championships in the Luzhniki stadium in Moscow, Russia, Tuesday, Aug. 13, 2013. Mohammed Aman Geleto is an Ethiopian middle distance runner. Born in Asella, he won consecutive 800 m titles at the 2009 and 2011 African Junior Athletics Championships. Related Post "Mohammed Aman wins 800 meters at world championships."